I have some truly depressing news to share with you today. 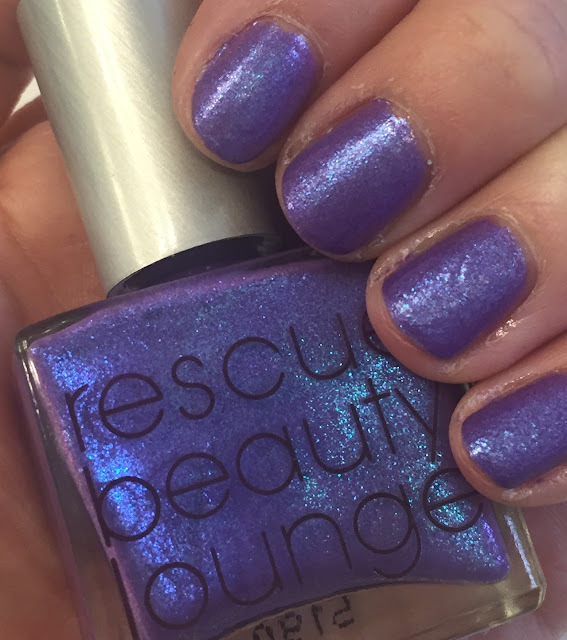 One of my absolute favorite nail polish brands, Rescue Beauty Lounge, is no more. The line's founder, Ji Baek, decided to move onto her next chapter after 17 years of bringing us beautiful shade after beautiful shade. I own over 30 Rescue Beauty Lounge polishes, and they're among my most beloved colors in my entire collection. I can't imagine not waiting with bated breath for Ji's new collection announcements, or not squealing excitedly over the colors with my best friend, Katie (who is another RBL lover). The first RBL color I ever fell truly, madly, deeply in love with was Recycle. I originally discovered it while shopping with Katie at Louis Boston back in 2010 (sadly, another fashion and beauty mainstay that closed this year). We were immediately smitten with the deep forest green hue ... and, ever since, it's been a passionate love affair. So, before the brand shut down for good last week, I simply HAD to buy a few more polishes. Katie and I decided to "buy them for each other" (which really meant buying and sending them to ourselves). I ended up buying six polishes, all of which I'll feature here in due time. But up first was Rescue Beauty Lounge GalaxSea, which is one of the colors from the last RBL collection, the Fan 3.0 Collection. Rescue Beauty Lounge GalaxSea. CHECK OUT THAT SHIMMER. GalaxSea was meant to look like an amalgamation of the sea and outer space, and it was dreamed up by RBL fan Danielle. The deep lavender hue is offset by turquoise flakie shimmer. It's fairly similar to one of my other RBL favorites, Scrangie, but on the lighter side of the purple spectrum. This is the kind of color I live for! 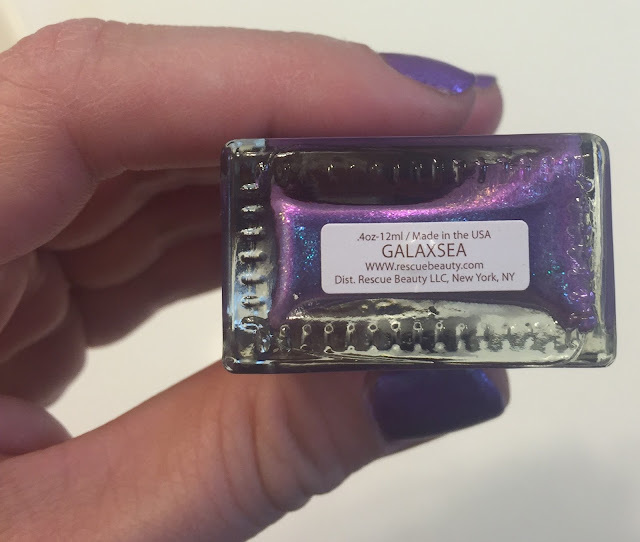 The bottom of the Rescue Beauty Lounge GalaxSea bottle. I really am so sad that Rescue Beauty Lounge has shuttered its proverbial doors. I completely understand Ji's decision and wish her nothing but the best as she heads into the future. But to say I'm devastated by the brand's closing is an understatement. Ji, I'm raising an RBL-painted hand in fond farewell. 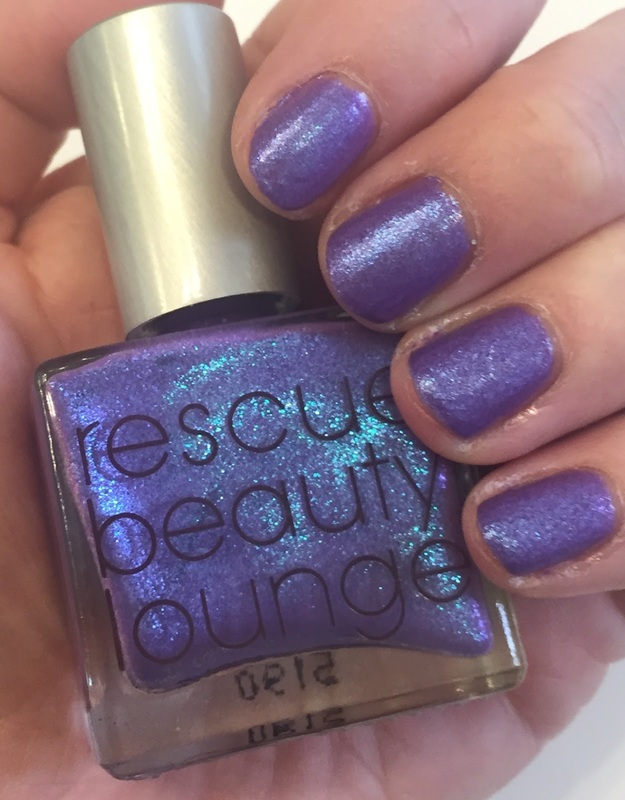 To see all of the Rescue Beauty Lounge nail polishes that I've reviewed, worn and loved over the years, please click here. So sorry, Jamie! I love Galaxsea that you're wearing, and I hope all the shades you've stockpiled will last a long time! WOW, this is absolutely GORGEOUS! I am ashamed to say it, but I've never tried this brand. Sad to see it go, but this shade is amazing! I love the inner glow that it has. I'm sad to see them go too. Some of the colors were so unique and the polishes were such a great formula. That is a gorgeous color! I've never tried RBL (perils of international nail polish shipping) but I have drooled over so many of their polishes. Sad to hear they are closing down. Oh man... this is such a pretty color and I love purples. It's sad to see this brand go because I have never had the chance to try it. Ooh I almost grabbed this! Now I regret not getting it, it's gorgeous! Oh this is sad. I've never tried any RBL polishes! Subscribe to The Beauty of Life!